Forum Index > Historical Arms Talk > Does anyone have a review of the CAS Practical Norman? Posted: Thu 29 May, 2008 11:02 am Post subject: Does anyone have a review of the CAS Practical Norman? Does anyone have a review of the CAS Practical Norman? strength and tightness of construction - no rattles, etc! I picked one up about a month ago, and I'm very happy with it (only done dry handling). Fittings are nice and tight; no movement whatsoever. Balance feels really nice, and I have great control during swings. Only negative is the last inch or so of the blade is really snug in the ABS scabbard it comes with. 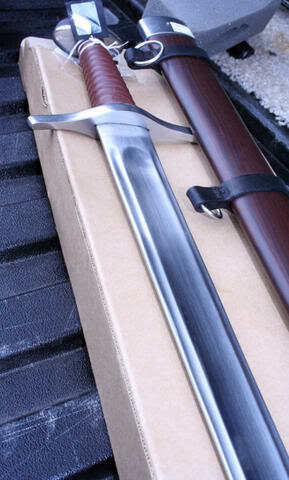 The shape of the blade generally was like nothing I have seen in the period historically. There was a weird sort of triple fuller and a Neanderthal-blunt (almost square) tip. Ive got the practical hand and half, as well as the practical viking by Hanwei. I can only say good things about these for their price. All the hilt parts are glued together to support peening which may not be so thorough (possibly cosmetic only - relying only on the glue.) Otherwise the quality of the steel, hardness, durability, flexibilty while returning to true, are all very satisfactory. At a good price they are a bargain. I own one and we used it recently for some fairly vigorous fencing. 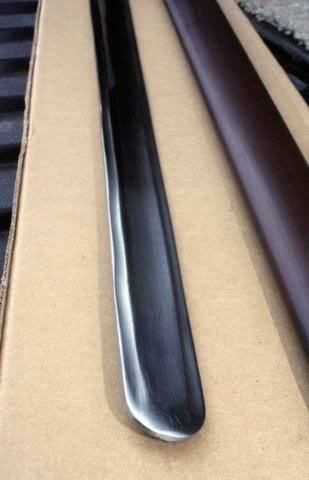 Like all of the Hanwei practical swords, it is the question of is it a good value for the money. I'd say absolutely. The sword balances well in the hand, making it feel lighter than it is and is *very* durable. Although a little stiff in the thrust, it is much more flexible than the practical arming sword based on their "William Marshal" sword. Is this as Albion I.33? Hell no! But for the price, it's a bargain. [quote="Douglas S"]I bought one and returned it. All of the latest revisions of the Hanwei Practical Medieval swords are fullered in the same manner as the Norman. Their blades' purpose is to be light, strong, and durable, and to be able to take the abuse given to a reenactment or stage combat (edge parries) sword. Therefore they don't look like a real Medieval blade. If you look at the released Albion Maestros, their blades are also different than standard Medieval ones. I have an Albion I:33, and it is very nice. However, I could have bought 4 Practical Normans (with scabbards) for the same price as I paid for the I:33. Precisely. It also doesn't weigh nearly what many of the UK reenactment blades do with 3mm edges and the like. They look like swords, but feel nothing like them. It depends on how rigorous your group's authenticity standards are, at the end of the day. BTW, Paul Binn adds a deep, wide fuller to minimize the weight and makes the pommel heavier to compensate for the blade thickness. With good balance, it's easy to forget about the weight.